Find your perfect working position with the Mabef Value Folding Field Easel. It features a pivoting canvas holder that can be adjusted to any angle — from vertical to horizontal — for oil and watercolor painting, sketching, and more. 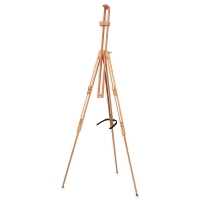 Because it's lightweight (just 3.5 lb), this easel is great for painting on location. 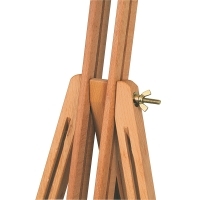 The portable easel holds canvas up to 45"H.
Fully extended, it measures 73" × 28-3/8". When folded, it's 32-1/2" × 5-1/2". 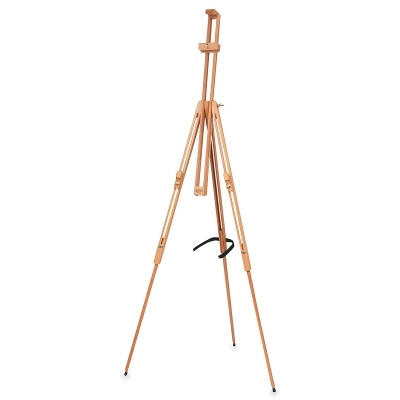 Made of high-quality, oiled, stain-resistant beechwood, this simplified, economy version of the Mabef Large Basic Field Easel M-29 comes with a hook-and-loop strap instead of leather.